World-class bluegrass entertainers Monroe Crossing will appear in concert at the Historic Chief Theater in Bemidji 7:30 pm Saturday, May 4th, with a 7 pm opening performance opening performance by Headwaters & Friends. Named in honor of Bill Monroe, Monroe Crossing dazzles audiences with an electrifying blend of classic bluegrass, bluegrass gospel, and heartfelt originals. Their airtight harmonies, razor sharp arrangements, and on-stage rapport make them audience favorites across the United States and Canada. The concert will highlight their most recent CD, “Monroe Crossing Plays Classic Country” honoring country legends such as Patsy Cline, Johnny Cash and Hank Williams. Doors open at 6:30 pm. $25 general admission tickets are available at Brigid's Pub, Greater Midwest Insurance or Headwaters Music & Arts, 218.444.5606, online or by stopping in at 519 Minnesota Ave NW. Advance purchase is recommended, tickets sell out fast. Hosted by Headwaters Music & Arts, proceeds support Headwaters Music Program Scholarships. We are gearing up for our annual instructor showcase, the time of year when we show our music program instructors the love they deserve for being so awesome! This years theme is We ❤ Headwaters. The evening will celebrate the diverse talents of our music instructors with a dynamic evening of tunes, varying in style and instrumentation. We need your help though! Prior to the showcase we will be posting a giant black heart in the Recital Hall that we want you to cover with all your writings and reflections about why you ❤ Headwaters. Next time you are in the lobby look for our table of Hearts & Crafts and take a moment to jot down one reason you ❤ Headwaters. We will showcase all the hearts at our annual showcase. Take a selfie with your heart, or with your instructor, you could even take a photo making art or practicing your instrument, and post it to social media with the #weheartheadwaters. Lets share the love! Do you want to attend the showcase? We would love to have you there! You can find out more and purchase your tickets here. Give the gift of creativity with Headwaters art clubs! Art elements and principles, techniques and critique are just some of the focus of Headwaters art clubs. With offerings for K-6th grade the clubs also put a focus on fun and listening to what participants want to focus on. The art clubs, which take place after school, are split up by age with the K-2nd grade meeting on Tuesday and 3rd-6th meeting on Thursday. Both art clubs have spent the fall discussing the 7 elements of art and practicing technique in different media such as paint, clay, paper, fiber, basic drawing and more. Young Artist Club for k-2nd grade is held 3:15-4:15 Tuesday evenings. The group has openings for their spring session when they plan to continue their exploration and growth with some of the same media. Instructor, Beth Andrews, says that “My favorite thing about art is using science and nature. This spring we are going to explore more of those things.” The group will continue to grow relationships and techniques this spring, introducing guest presenters to share their knowledge with the participants. The goal of Headwaters art clubs is to provide an informal, safe and supportive atmosphere while offering high quality art instruction and mentor-ship. More details and online registration can be found by calling 218.444.5606 or on Headwaters website. Those who register before Dec. 25th will receive a holiday discount! Space is limited to first 15 participants. Art supplies provided. Early arrival supervised open studio time 3:30 -3:55 available for additional fee. Space is limited to first 20 participants. Snack and art supplies provided. It is that time of year when all of us are seeking holiday cheer (and some holiday deals). We have been really cheery this season and we are happy to share! Our December 1st CD release really sent us off this December with the feeling of gratitude. Gratitude towards our supporters and community that came out to raise funds, and gratitude to artists who donated their time and talent to help us with our largest fundraiser of the year. We feel as though all that joy and gratitude comes forth in the tunes. You can check it out yourself by purchasing your own CD, or ordering a digital download. Keep the tunes on circulation through this holiday season (we certainly are! 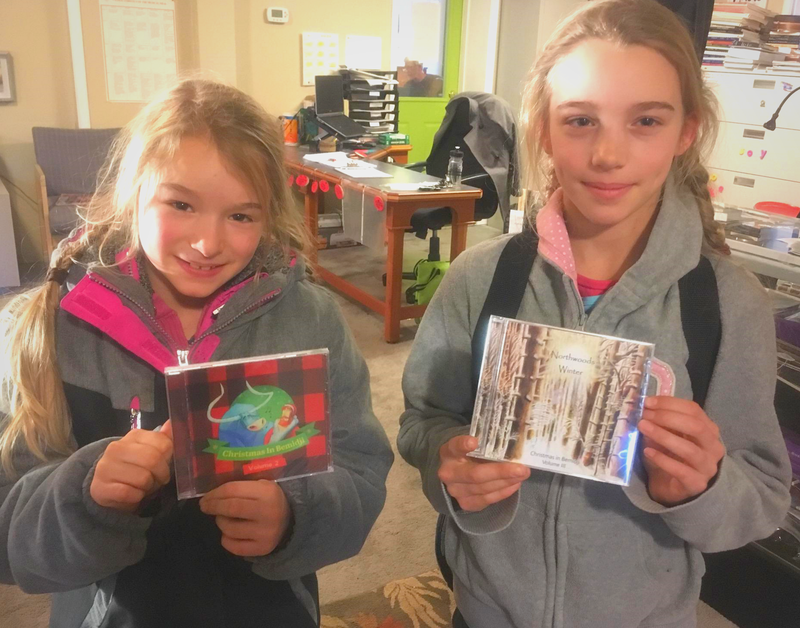 ), and if you are looking for even more great tunes imbued with gratitude and joy we have a limited number of copies of Christmas in Bemidji Vol. II, that you can add to your playlist. We know, it seems a bit early, but around here we are always looking forward and right now we are looking forward to fall. Jessica (our Music Program coordinator) just created a nifty 2018-2019 calendar with an updated schedule, and we are starting preparations for our Fall Kick-Off event as well as considering music lessons and fall programming. Getting ready for fall is a fun task but we know we could use some help. If you are an artist, musician, or community focused volunteer we are looking at you! Are you interested? Check out the list below and click on the highlighted links to find out more. We can’t wait to have you be apart of things here at Headwaters! We are seeking artists to exhibit there work in our recital hall in the coming months. We have a simple application for you to fill out and you will receive a follow up phone call or email to discuss. It is a pretty painless process 😉 If you are an artist with a body of work and you are itching to exhibit check out our application. Music instructors our one of our most valuable assets. We have some of the most talented musicians in town instructing at Headwaters, but we could always use some more! If you are interested in instructing please check out or Position Description and then give us a call to discuss. We are always searching for volunteers! We have an awesome crew right now but we could always use some more. If you are interested you can fill out our online application. You can also become a member! For as little as $50 a year you can receive a membership which helps to sustain our programming and gives you the satisfaction of knowing you helped out your community. Besides that, there are also some pretty neat rewards and benefits including cool discounts on various programming. Become a member today. We truly appreciate our community and we want to to thank you for being a part of it. Whichever way you may be a part of things here at Headwaters we are grateful you are and we look forward to seeing you around😊! Laura Packers workshops have been postponed. Stay tuned for further updates.